“Extensions” – Concepts – Learn – Symphony. Extensions add specialized functionality to the lean, mean Symphony core. Extensions are add-ons that can provide additional functionality for your Symphony project. Some more common uses for extensions include providing additional field types and text formatters, enhancing the admin interface, and even bundling entirely new features. Symphony’s open Extension API (forthcoming) makes it easy for developers to contribute new extensions. Extensions must be placed in the extensions/ folder of a Symphony installation in order to be made available to the system. 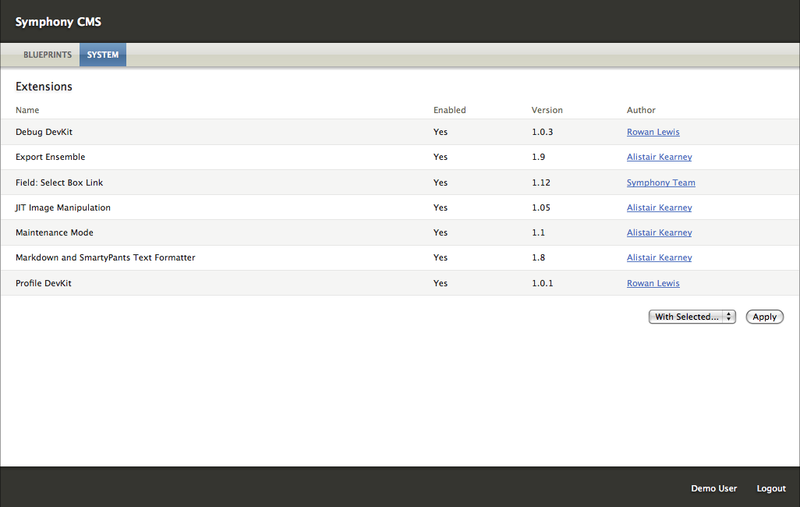 They can be managed in the admin interface, under System > Extensions. Individual or bulk management is possible by selecting extensions and using the "With Selected" dropdown to Enable, Disable, or Uninstall. Extension Name | Description -------------- | ----------- Debug Devkit | Provides front-end debugging interface via the ?debug param. Export Ensemble | Enables the creation of ensembles in the admin interface. Select Box Link field | Field type that enables the creation of persistent relationships between section entries. JIT Image Manipulation | Enables on-the-fly manipulation of images via specially formed src URLs. Maintenance Mode | Enables maintenance mode. Markdown Text Formatter | Provides Markdown text formatter which can be applied to text area fields. Profile Devkit | Provides front-end profiling interface via the ?profile param. Extensions can provide all kinds of features for a Symphony project. The Symphony website hosts a library of extensions with far-ranging capabilities. Among other things, extensions can provide custom data sources, events, field types, text formatters, localization dictionaries, and more.